You’re proud of the way you conduct your research. Experience has taught you to maintain a strategic overview and review plans regularly to keep research goals in sight. You remain open to new ideas and possibilities by collaborating and engaging in discussion within and beyond your field. Do you apply the same approach to developing your own career? If not, it might be worth a few minutes of your time to stop and think about why not. 48% of respondents to the 2015 UK Careers in Research Online Survey said they did not have a clear career development plan. A similar number keep no formal record of professional development activities. If you’re with the 48%, reflect on why. Are you too busy with your project to think beyond? Are you putting it off? Do you prefer to ‘go with the flow’? Perhaps you feel your dream career should be a natural extension of excellent research. Understanding yourself is a good start but what then? Vitae, an organisation that champions researchers’ professional development, offers online resources for individuals: one such resource is the Vitae Researcher Development Framework (RDF). Depending who you are, that might sound highly appealing or deeply uninteresting but hear me out while I explain how you might find it useful! The RDF is grounded in research and describes the knowledge, behaviours and attributes of a successful researcher. It breaks all this down into 4 domains, 12 sub-domains and 63 descriptors then expands on each for up to 5 phases of development. So far so methodical, but what can you actually use it for? It’s great as a thinking tool. Simply looking systematically through each area can help you identify and prioritise development needs as well as recognise areas of existing strength. You might even see attributes that you hadn’t previously associated with research. Still undecided on career direction? Focus thinking by asking yourself what RDF areas you excel in and which you’re most excited about developing. The RDF is appropriate to researchers at any career stage and whether you already have a career master plan or no plan at all. If you don’t want to continue in academia or even in research it can help you identify skills you developed as a researcher, consider how these might be transferable to other contexts and articulate that. Most good things need a plan to make them happen, whether it’s a simple or an elaborate one. To start, you could list areas from the RDF (for example the 12 sub-domains) and brainstorm possible actions to develop knowledge or skill in your own priority areas. You might also note down evidence to demonstrate existing strengths by area: think about evidence that would be useful for your CV. If you have an existing career development plan, check it against the RDF to identify gaps. Ask peers, a line manager or mentor for feedback on the strengths and development needs you’ve identified and ask for ideas on opportunities to gain new knowledge and skills. Can you use your plan in a formal appraisal? OK, so this is very well in theory but actually, there are 63 descriptors and each has up to 5 phases of development – help, I’m overwhelmed! This is something we’ve heard before at Vitae so we’ve produced some complementary tools. 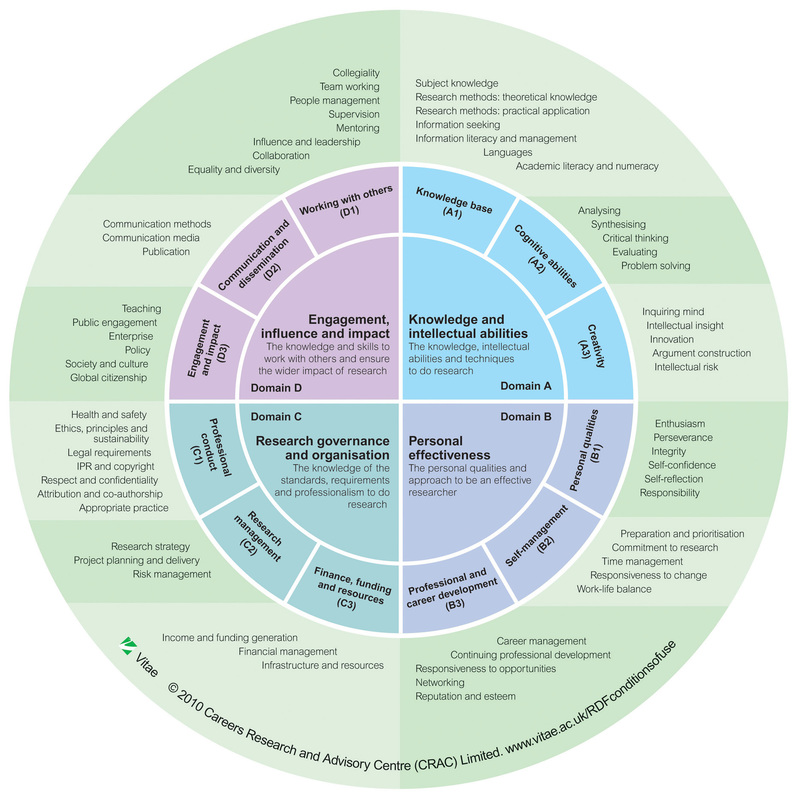 Our lenses on the RDF pick out a sub-set of knowledge, behaviours and attributes with relevance to a specific context. For example we have lenses for getting started in research, teaching and knowledge exchange. If you want something to make planning and storing information easier, you might try our online app the RDF Planner which is available by subscription (before you subscribe as an individual, find out whether your institution holds an organisational subscription you could use). Good luck. But remember, “Chance favours the prepared mind“ – Louis Pasteur. Find more advice and resources tailored to researchers on the Vitae website: www.vitae.ac.uk. Members, register for best access. Most UK universities and institutes offer Vitae membership to their staff and students. RDF graphics for web and print can be found here.